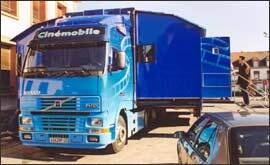 It consists of an articulated unit, the trailer of which expands and unfolds to provide a 102 seat self-contained cinema. The Screen Machine provides conventional up-to-date 35mm screenings of recent movies, with full digital surround sound, air conditioning, comfortable raked seating, and full disabled access. It can also provide video projection and PowerPoint conference facilities. The Screen Machine was developed by Highlands and Islands Arts Ltd (HI~Arts) to serve the communities of the Highlands and Islands of Scotland. This is an area greater than Belgium, making up more than 50% of the Scottish land mass, but with only 0.6% of the UK’s population: 368,000. There is only one community in the entire area—Inverness–with a population of more than 15,000. Apart from Inverness, there are full-time cinemas only in Kirkwall (Orkney), Fort William (Highland), and Oban and Dunoon (Argyll). A new two-screen cinema recently opened in Thurso (Highland). Many island areas: the Western Isles, Shetland, most of the Inner Hebrides, have no access of any kind to 35mm cinema. It recently made the local headlines in Harborough, one of the small towns that had lacked its own cinema. The cinema will show films within two weeks of their release and there will be three different showings each day with popcorn and other snacks available. It is hoped tickets, priced at about £6, will be available from various outlets in the district and through an online booking system on the Harborough cinema campaign website www.harboroughcinema.com. Mr Campbell stressed the mobile unit will be a temporary measure and that it will leave as soon as a permanent cinema is up and running. In the meantime he hopes it will show the viability of a cinema project to potential developers. A list of films playing on Screen Machine 2 can be found here, where you will also find this video of the Screen Machine in action. There have been other examples of this concept coupled with digital or electronic screening of films, such as Mexico’s Cinetransformer and Norway’s Bygdekino. The Movie Machine will provide a unique respite for servicemen and women in Afghanistan who have precious few home comforts. For a couple of hours, they can enter another world, and be transported back to the Odeon or Ritzy in their hometown. The stylish, comfortably appointed, air-conditioned Movie Machine will provide three screenings a day in Camp Bastion, entertaining up to 1680 troops a week. The $1m dollar rig is being flown out to Afghanistan in a giant Russian Antonov 124 aircraft. Armed forces charity Services Sound & Vision (SSVC) bought the truck, while the Ministry of Defence pays the running costs. SSVC operates 10 cinemas on British military basis in Germany, seven in the UK, three in Cyprus and one on the Falkland Islands. For the difficult and dangerous job that they do, few people deserve a movie break as much as they do. Let’s just hope that they get popcorn and soda with it and don’t have to sit through 20 minutes of advertising at the start.